With an electronic card swipe system, you can secure your building by managing who gains entry and remove the risk of lost or misplaced keys. These cards are individually programmed to provide restricted access around a site through gates, doors, turnstiles, traffic barriers, etc. MIFARE® is the dominant contactless smart RFID and proximity card technology, which is widely used pre-paid as travel cards in transport applications. Borer have used MIFARE® technology for than 15 years and was one of the very first security access control equipment manufacturers to adopt it for access control applications. 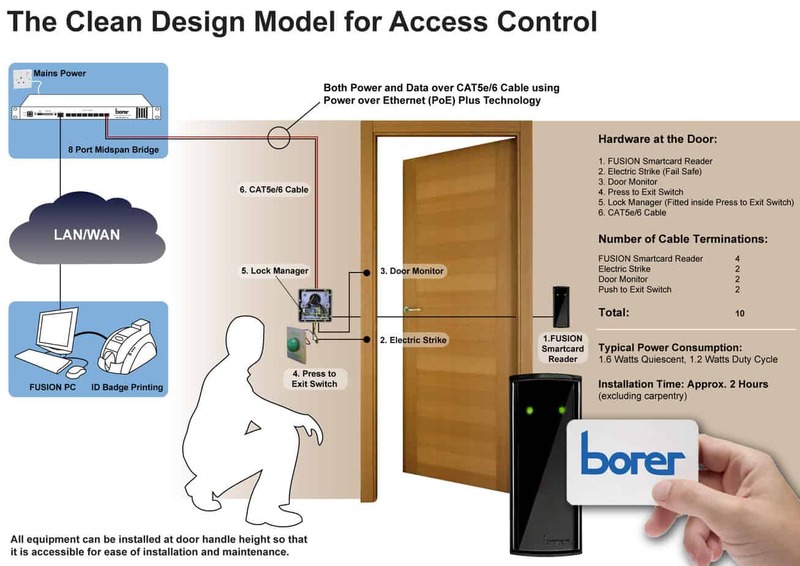 Borer’s Access Control Solution is designed to work over your corporate LAN using TCP/IP and your existing CAT5e structured cable network. Utilising Power Over Ethernet (PoE) Technology, additional mains outlets and power supplies at each door are not required as power is delivered down existing network cable, reducing energy bills, infrastructure requirements and installation costs. Control of these systems via your PC potentially offers far wider applications than just security of your premises, as they can also help you to locate staff in event of an emergency, or record their times of entering and leaving the building. Security using Proximity Cards is enhanced with the addition of PIN and Biometric controls with the cardholder's fingerprint stored in the card or on a central database as part of multi-factor authentication. 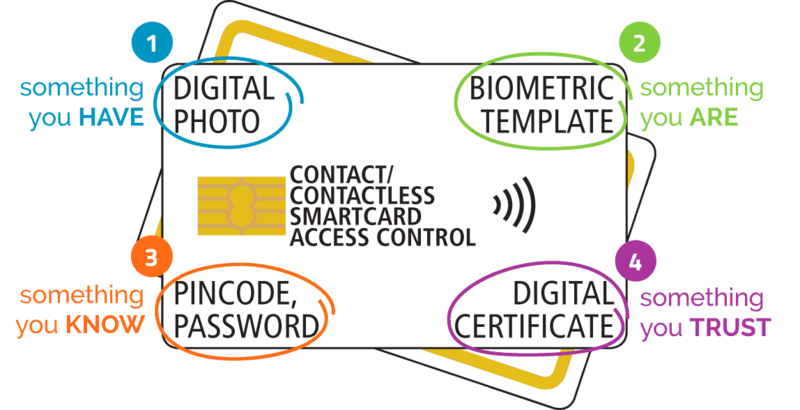 A Fourth Factor is the digital encryption certificate stored in the smart card, which increases the security of the card. Any combination of these authentication factors ensures a high level of security. All cards and tokens are user programmable, which unlike systems that use proprietary and exclusive formats, eliminates single supplier dependence and benefits the user with lower cost new and replacement cards. Borer smart card readers and controllers are ideal for any organisation that already uses MIFARE® cards. 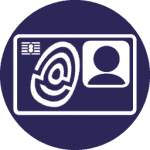 Applications include student ID cards, student attendance registration, loyalty cards, ticketless transport, cashless vending, library card and secure PC log-in. Organisations benefit from the convenience of using just one card for many applications. MIFARE® ISO 14443A compliant card and tags each carry a 1K or 4K chip. It has a unique serial number as well as sixteen 64-byte sectors. The 48 bytes of data on each sector is protected using a 16-byte transport key that encodes and decodes the data when it is written to or read from the chip’s memory. A MIFARE Classic® 4K holds 4K bytes, made up of thirty-two sectors of 4 blocks each and sixteen sectors of 16 blocks each (a block is 16 byte of data). It requires a user definable access key to access each memory block. The MIFARE® DESFire® EV1 has many more hardware and software enhanced security features than the MIFARE Classic®. It uses ISO/IEC 14443-4 compliant protocols with a 3DES/AES cryptographic accelerator for very fast transactions processing. It comes pre-programmed with the MIFARE® DESFire® operating system which provides a flexible tree style file structure, which supports up to 28 applications each with up to 32 files. It is available in three variants with two, four and eight Kbytes of data storage. 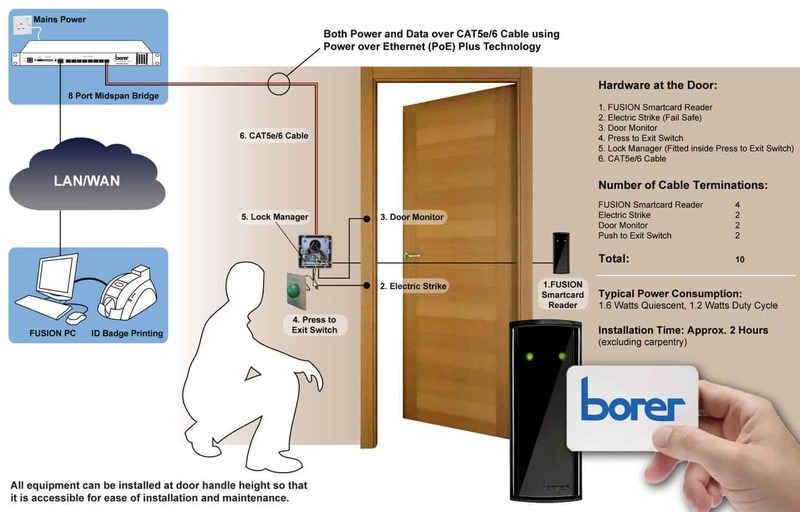 Borer's FUSION is a totally scalable Power over Ethernet Access Control System which can grow from a small single site application into an enterprise wide multi-location system as your requirements expand, all with the minimum of operator training or reconfiguration. 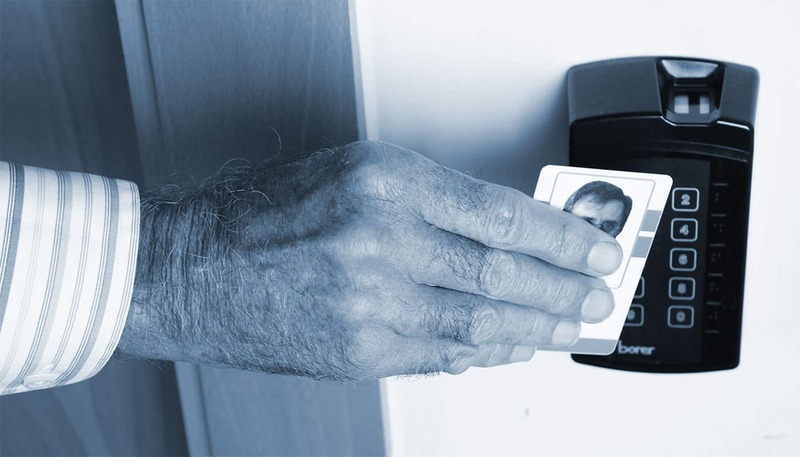 Smart Card Access Control is part of the Borer FUSION Management System which includes Visitor Management, ID Badge Designer and Time & Attendance.